Hello all! If you know me on a personal level then you probably know that I don't want a Kindle, Nook or any one of the many e-readers out there. There's nothing like sitting down to read a good and physical copy of a book. Since I started reading, which was at the age of three, I've always had a "thing" for books. I not only like to read them, but I actually love them (And I've been teased my so many of my friends about this!). In high school, I implemented a "no lending" rule. I lent a friend of mine two books. One was Uncle Tom's Cabin by Harriet Beecher Stowe and the other was Pride and Prejudice by Jane Austen. The first was never returned, the latter was returned with a torn cover. I decided that I didn't like the way people treated books. I hated bent covers and folded pages so I gave up lending out my books...to ANYONE. I think the invention of the e-reader is brilliant, not to mention convenient. Some authors really love it. But the rise of the e-book threatens the constancy of the bookstore. I can't fathom a world without bookstores. As a young girl I would spend entire Saturdays in Barnes and Noble reading and eating cupcakes from the cafe. Don't get me wrong, I've accepted the e-book, but I do hope that there will always be people like me. I hope that there will always be a choice. I'm still pulling info off the shelves from the 2010 Florida Writer's Conference. I attended a discussion on how e-books are changing the publishing industry and I thought I'd share. -Publishing is in a talespin (Bookstores are in trouble. Some stores are closing quietly. Even Walmart and Target will soon reduce their book inventory). -At the moment Amazon is selling more e-books than hardcover copies of books. -One benefit of the e-book is that authors are able to pinpoint what consumers are actually purchasing their books. -Some authors such as Steven King, Stephanie Meyer, and Steve Berry have announced e-book only titles. -Dorchester Publishing is going completely digital. -The world at your fingertips- It takes less than 5 minutes to purchase an e-book. -The e-book is changing how we read. Carrying around your e-reader allows you to read anytime, anywhere at the exact place you left off. Kindle software can sync to other mediums such as your laptop, desktop, phone, etc. You can forget your book at home, but when you buy a digital copy, you almost always have access to it. - Authors make less per book, but they're selling more copies. -Retailers are able to contact consumers about upcoming releases from authors of books they've already purchased. -E-books allow retailers to deliver the product to the consumer where and when they want it. -With E-books, "All the world's a stage." What about you? 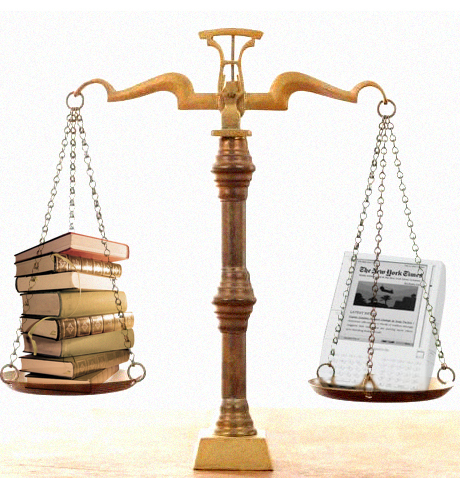 Do you prefer an e-reader or physical books? Thanks for sharing that info from your conference. I think e-books are great for series. That's the main reason me and Pam got one. When you have a small bookshelf, it's a lot easier to keep books from a series on the e-reader then shoving them in your bookshelf. Also, e-readers can be used to read Word docs like if you are beta reading for someone. I was like you, never thought I would be able to NOT physically touch my books, but I have to say, I <3 my Cruz Tablet from Borders (when it's cooperating)! I don't have a e-book reader but I have considered. My main issue with them is the fact that looking at computer screens for long periods of time is not good for your eyes. If you think of it that way then reading books continually on a screen is not so good. However, I too love the feel of books and bookstores, not to mention libraries. My whole goal for an office has always been to have this amazing bookshelf with lots of hardcover books. If we get rid of books then that dream dies. I say the same as there are both cable, dvrs, and dvds then there should also be room for real books and ebooks. I used to think I'd never want an e-reader. But then I got a Kindle for Christmas...and I really like it! It doesn't strain my eyes (it's not back-lit like computers and iPads are) and I love the fact that all of these books are at my fingertips. I've read one book on it so far and my reading experience was the same as with a printed book. It's the story that really matters, not the format. I read a lot so having a Kindle won't increase my reading. I also enjoy printed books and will still keep reading them and visiting bookstores. But since I live in a small apartment with limited bookshelf space, I think I'll start buying more eBooks as well. Racquel, my take on the matter is that e-books and e-readers are more of a convenience for travel/storage and that they will never take the place of a good hard copy! Like you, I have yet to purchase one...the closes I've gotten is downloading the Nook and Kindle for PC :) but, I make frequent trips to the library and always purchase hard copies from my favorite authors. Great highlights from the conference. I also didn't like e-readers but I do love my Kindle for traveling. I think e-readers may potentially help the picture book market though because of the interactivity that can be used. But I'll always love printed books. I still buy them. I haven't bought one yet, but I will. Based on where I live, it will be a lot cheaper to support fellow writers. I've come to embrace e-readers even as I continue to enjoy physical books. When traveling (or in my case, temporarily living abroad), absolutely NOTHING beats forgoing the bulk of physical books for a low-profile, high-capacity alternative. However, I don't dislike e-books at all since they help decrease deforestation. I am PRO-environment and taking care of our forests. So yes, I am torn. I also agree with you about lending books. It may sound selfish but I rather buy a book and give it to someone than lend it and never get it back. Hi Racquel! Jenna Wallace left a comment on my blog today with a link to your blog. I mentioned the rise of the e-publishing industry and she thought I'd enjoy your post. So glad she directed me to you! I, too, hate the idea of bookstores becoming obsolete in a world where downloadable books are the only format available. I'm trying to embrace the technology...while getting my work published on printed paper before the shift is complete!